This week - end I tested one particular strategy for cycle trading from Ehlers. "The action of the half cycle moving average and full cycle moving average suggest a trading system. You would sell the the half cycle moving average crosses the full civle moving average from bottom to top, because this is where the sine wave has its peak value." You would buy when the half cicle moving average crosses the full cycle moving average from top to bottom because this is where the sine wave has its lowest value. Note that his trading rules are exactly the opposite of the rules for short and long moving averages in trend following systems. As the half cycle moving average lags the sine wave exactly by 90 degress. 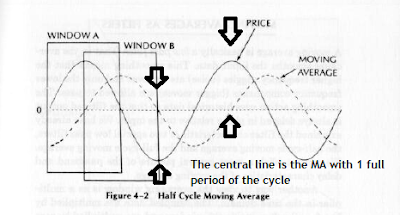 The fulla cycle moving average in theory should be at the zero point, regardless the phase angle position of the window: there are as many as positive than negative points. as you can imagine I wanted to try to test this strategy by csusotmizing an EA. The results are. OK. When I try to test below 4 h, the results are consistent loosers. Really consistent. On 4 h time frame sometimes it catches some cycles. On 1 day time frame it also catches some cycles. However this worked only recently when tested on longer periods of several years, loosers again. The expert EA is here.